Designed to handle high flow when line pressure is not a critical consideration or otherwise absorbed. Aluminum Body: Lighter weight, easier to maneuver. Replaceable Hold-Open Rack: For use when fueling large-capacity tanks. Nozzle must be attended at all times during usage. Right Angle Design: Provides larger lever area for better grip and easier control; permits nozzle to fit into awkward spaces close to walls and into corners. 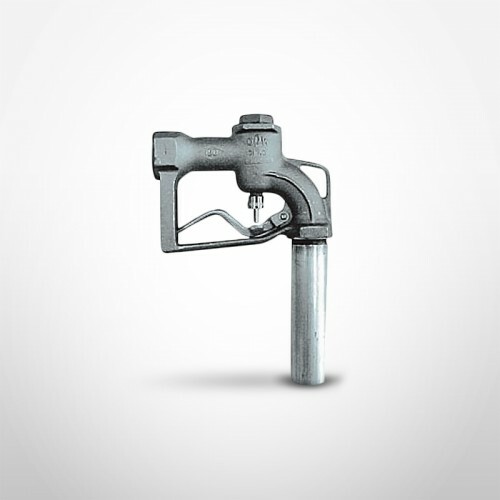 Drag Lugs: Protect the nozzle when dragged across rough surfaces; enhances long-life durability. Easily Replaced Spout: The spout is easily threaded into the body. Replacement spouts are readily available from OPW. NPT Female Threads at Inlet End: Standard pipe threads accept all standard 1", 1-1/4", 1-1/2" and 2" male connections.